Sous vide cooking is the easiest, most foolproof way to cook meat, poultry, fish, eggs, and vegetables and requires little technique. Meat and poultry will become succulent and fork-tender, you'll never overcook fish again, and you'll swoon over sous vide-style soft boiled eggs. You'll get used to people asking if you went to culinary school. Sous vide, French for under vacuum, is a way of cooking ingredients long and slow in a water bath that's kept at a consistent temperature using an immersion circulator. Once you cook sous vide you'll be hardpressed to go back to the old ways of cooking. 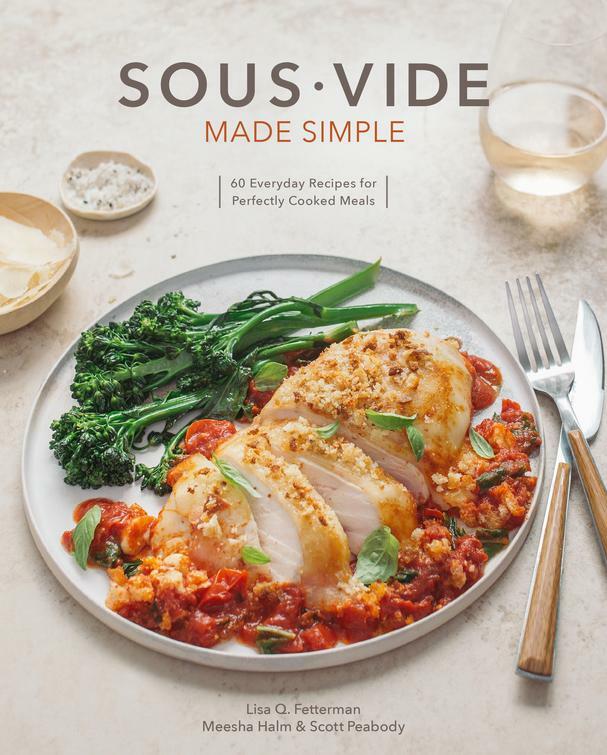 Lisa Fetterman, author and co-creator of Nomiku, the first sous vide company geared for home cooks, solves the weeknight meal quandary in her newest cookbook Sous Vide Made Simple: 60 Everyday Recipes for Perfectly Cooked Meals. The key, says Fetterman, is using an immersion circulator (a device that looks like an immersion blender stick, but bigger) to cook main ingredients ahead of time, which can then be adapted into various fuss-free dishes with ease. Sous Vide Made Simple includes master recipes for foolproof meats, fish, poultry, and vegetables and features these main ingredients into spin-off recipes for a complete meal, such as the Beef Bourguignon Pot Roast featured below. The first few chapters are devoted to a main ingredient - Eggs, Chicken, Pork, Beef, Shrimp and Fish, Vegetables, Desserts - and Pantry basics, which includes sauces and condiments. In Beyond the Recipes, Fetterman gives tips for creating one-bag meals and how to adapt any recipe to sous vide. She includes a handy time and temperature guide, measurement conversion charts, and explains in detail how to use the book, how to get started, and the essential tools you'll need to cook sous vide. As a busy working mom, I cook sous vide at least once a week. It truly takes the effort out of cooking without sacrificing quality and taste. This book has given me 60 more ideas for easy meals! I hope you'll love it too. "Whenever I think of boeuf à la Bourguignon, I can’t help but hear Julia Child’s lilting, reedy voice proclaiming it “one of the most delicious beef dishes concocted by man.” Whether or not the voices in your head match mine, Julia was right—this luscious stew, rising from Burgundy’s peasant fare to the pantheon of French haute cuisine, is undeniably irresistible. Though commonly prepared as a stew, with small chunks of meat, I like using a single large piece and serving it as pot roast Bourguignon for a more dramatic presentation. Another untraditional twist is to use cocktail onions, which add a sweet tanginess to the dish, but frozen pearl onions certainly work as well. Serve with mashed potatoes, plain white rice, or buttered egg noodles so that none of the delicious beef juice goes to waste." Remove the cooked braised beef from the bag, reserving any liquid in the bag. Thoroughly pat the beef dry with paper towels. Dust the beef with 1 tablespoon of the flour, patting it to form an even layer and shaking off excess. Set aside on a plate or tray. Melt 1 tablespoon of the butter over medium heat in skillet or sauté pan large enough to fit the pot roast, until sizzling but not browned. Add the bacon and cook, stirring occasionally, until the bacon has rendered fat and is beginning to turn brown (but not crispy), 2 to 3 minutes. Remove the bacon from the pan with a slotted spoon, leaving behind the rendered fat, and transfer to the paper towel–lined plate. Set aside. Increase the heat to high. Add the floured beef and sear, turning once, until deep golden brown, about 2 to 3 minutes per side. Lower the heat to medium and transfer the beef to a plate. Set aside. Add the remaining 1 tablespoon of butter, the shallot, and garlic to the pan and cook, stirring constantly, for 30 seconds. Stir in the mushrooms and let them cook, stirring occasionally, until their liquid has been released and evaporated, 2 to 3 minutes. Stir in the tomato paste and cook 2 to 3 minutes more, stirring frequently until it takes on a darker shade, then add the remaining 2 tablespoons of flour and cook 1 minute longer. 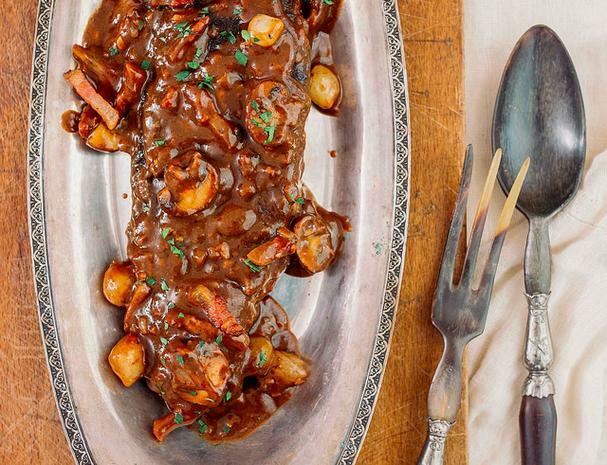 Pour in the red wine while stirring, scraping any brown bits at the bottom of the pan to deglaze. Bring the mixture to a boil and cook for 1 minute, then stir in the reserved beef cooking juices, the beef stock, cocktail onions, and thyme. Allow the mixture to return to a boil and then lower the heat to a simmer. Stir in the reserved bacon, then season to taste with salt and pepper. Preheat the water bath to 65°C (149°F). Season the beef with salt and place in a 1-gallon freezer-safe ziplock bag or a vacuum seal bag. Arrange the meat in a single layer with as little overlap as possible to ensure even cooking. Seal the bag using either the water displacement method or a vacuum sealer. When the water reaches the target temperature, lower the bagged beef in the water bath (making sure the bag is fully submerged) and cook for 18 hours (or up to 30 hours). I recommend covering the bath with plastic wrap or aluminum foil to minimize evaporation and ensure that the bag remains fully submerged the entire time. Remove the bag from the water bath, transfer it to an ice water bath, and chill until completely cold, about 30 minutes. Once cooked and chilled, the beef can be refrigerated in the bag for up to 2 weeks. Alternatively, if you plan on using the just-cooked beef in a spin-off recipe right away, let it rest in the bag for at least 10 minutes or up to 1 hour before proceeding. Because this master recipe requires longer—albeit hands-off—cooking time, and also because it makes excellent leftovers, I call for cooking a larger amount. If you don’t eat it all at once, seal the leftovers in the bag using the water displacement method (page 12) or a vacuum sealer and store in the refrigerator for up to 1 week or the freezer for up to 1 month. To reheat, warm in a 65°C (149°F) water bath for 30 minutes, massaging the bag with your fingertips after 15 minutes to distribute the contents and ensure even reheating. Be careful when selecting the cut of beef for these dishes: cuts that are too lean or that have too little connective tissue (think filet) will become dry after such a long cook, whereas certain tougher cuts (think short rib or shank) will require even more time to become tender. The cuts that hit the sweet spot include those from the chuck (shoulder), which are sometimes sold as “chuck steak” (flatiron steak is also a specific chuck cut), or top sirloin (culotte, aka sirloin cap, is a specific top sirloin cut). If the recipe calls for cubed beef, tri-tip is another great choice.